TRILOK STEEL INDUSTRIES is distinguished manufacturer, supplier & exporter of Stainless Steel Condenser Tube, specifically designed to efficiently condense process fluid off of the outside of the tube.We supply these Stainless Steel Condenser Tubingin different sizes, shapes and designs as per clients’ specifications at reasonable price. We has earned the status of preferred stockist and distributor of Stainless steel Seamless Condenser Tube and Stainless Steel Welded Condenser Tube or welded drawn tubes in a multitude of sizes ranging from 0.010” OD to 1.500” OD with wall thickness as light as .003”.Trilok Steel Industries has earned the status of preferred Stainless Steel Condenser Tube manufacturer in India. We are well known exporter, dealer and trader of Condenser Tubein a number of standard sizes and grades, including 304/304Land 316/316L. Condenser stainless steel tubingis used for parts of energy type equipment such as Condensers, steam super-heaters, steam pipelines, etc.Buy SS Condenser Tubeat best price in India. 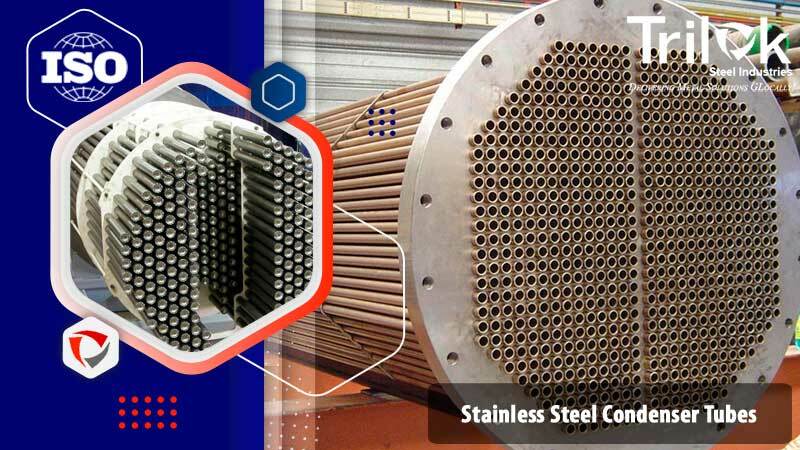 TRILOK STEEL INDUSTRIES offered Stainless Steel Condenser Tube is widespread in heat exchangers, from being part of a condenser and evaporator refrigeration cycle in a chiller, to condensing steam in surface condensers, and everything in between. Generally, these SS Condenser Tubing, is commonly manufactured with an O.D. of 5/8", 3/4", and 1". Some applications, particularly ammonia chillers, use larger O.D. tubes than these. Condenser tubes can also be internally and externally enhanced to further increase their efficiency. SS Condenser Tubes designed specifically for the role condenser tubes play in the heating, cooling or reheating of fluids and gases, our precision tubes are commonly used in thermal and nuclear power stations, as well as chemical processing plants. We supply Stainless Steel Seamless Condenser Tubesin straight lengths up to 20 m. Completed packages of U-bent tubes and P-formed tubes can be supplied in ready-to-be-installed condition. We can customize the ideal Stainless Steel Condenser Tubingfor your unique application.We stocks both seamless (ASTM A269/A213, ASME SA213 average wall) and welded (ASTM A269/A249) tube condensers to meet the needs of petrochemical, CNG, geothermal and flow measurement applications.Contact to Trilok Steel Industries for confirm availability and pricing. 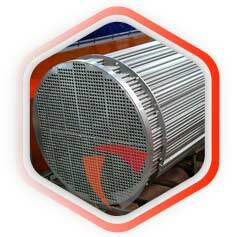 check latest updated price of Stainless Steel Condenser Tube. Stainless Steel Seamless Condenser Tubing, Steel Condenser Tube, SS Condenser Tube Dealer in India, High Quality Stainless Steel Condenser Tube, Stainless Steel Condenser Tubes Exporter in India, Condenser Stainless Steel Tube Exporter, Seamless Stainless Steel Condenser Tubes. Suppliers of Stainless Steel Condenser Tubes, 304 Condenser Steel Tubes, Stainless Steel Condenser Tube Exporter in India, SS 304L Condenser Tube , SS 316 Condenser Tube Supplier in Mumbai, India. Stainless Steel Condenser Tubes are finished in accordance with customer needs regarding dimensional and wall thickness specifications as well as heat treatment for more demanding applications. In general a Stainless Steel Condenser Tube is manufactured according to current standards API, ASTM, and ASME. 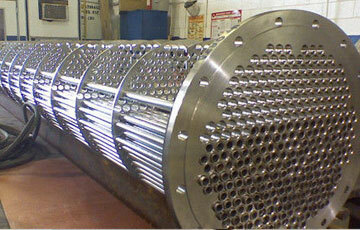 If required for special projects we can also supply large diameter Condenser Tubes. Our seamless and welded drawn tubes range in size from under 0.010” (1/4 mm) right up to 1.5” (38.1mm) outside diameter, and we can produce finished wall thicknesses down to less than 0.002” (0.05 mm) through to 0.150” (3.8mm). You can order straight lengths of tubing from us up to 45ft (14m) long or coiled tubes up to 3,200ft (975m) in length. Trilok Steel SS Condenser Tube Manufacturer & Suppliers in India,Stainless Steel Shell And Tube Condenser & Tube For Heat Exchangers Stock For Sale, Check ASTM A249 Condenser Tube Price List & Sizes.